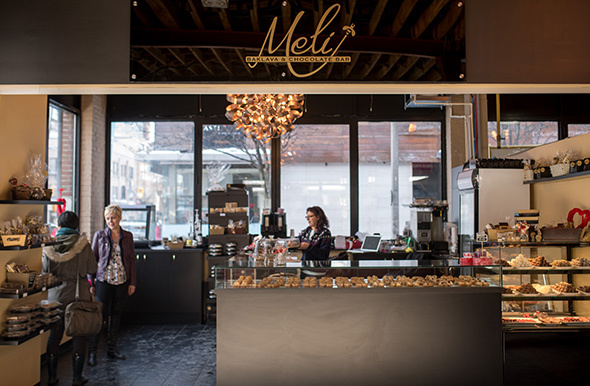 Meli Baklava & Chocolate Bar opened in mid-December inside the Queen Live Fresh Food Market by Queen and John, taking over the space previously occupied by the bubble tea stand Comebuy . 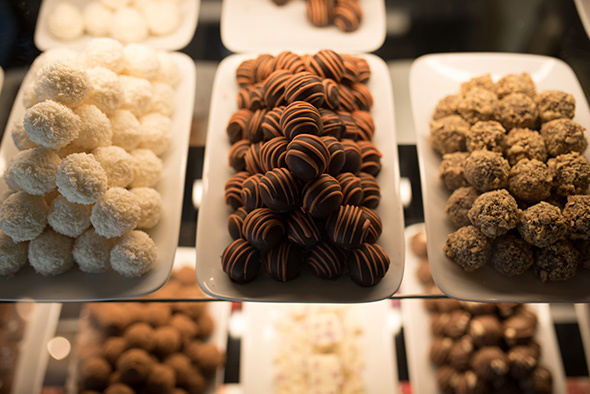 Dainty and delicate-looking baklava and chocolate truffles are on display like little pieces of fine jewellery in glass cases when you pass the kiosk, making it difficult to resist stopping to take a look. The four partners who own the business bonded over a love of good quality food and wanted to try taking a gourmet approach to baklava. They started a year ago with a production space and small showroom in Scarborough, and after experiencing success selling their products wholesale to fine foods stores like McEwan's, Pusateri's, Michael-Angelo's and Sobeys Extra, they've decided to open their first retail-only space downtown. 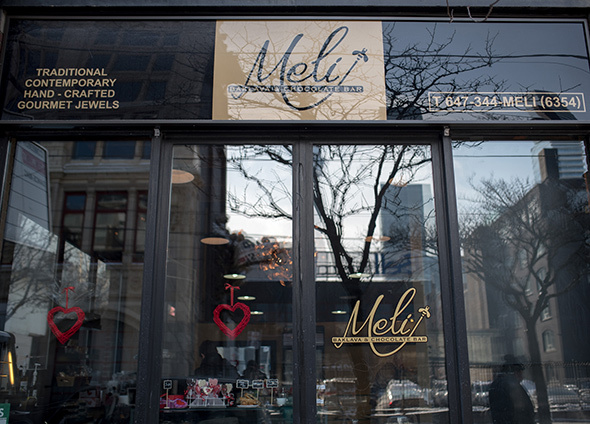 "Meli" means "honey" in Greek, and the two baklava chefs, Niki and Taso - who are originally from Athens, and each have over 20 years of experience making these handcrafted pastries - tried many different kinds of honey before finally settling on a local Ontario white for their recipe. There is no cutting corners; they use real butter and honey (no corn syrup), and stress how important quality is to them. 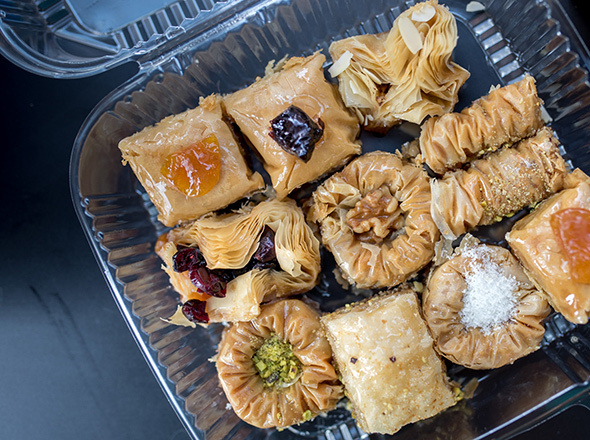 The baklava comes in a dizzying array of sizes, shapes and flavours: small baklava ($1.50/piece) take the form of round bird's nests, triangles and "fingers" that are dipped in dark chocolate; then there are larger squares ($4.50 each) and even whole made-to-order, pre-sliced cakes ($30-40). The plain, traditional version of the pastry are offered as samples of its quality, and sure enough, it's delightfully flaky, crispy and satisfyingly sweet. 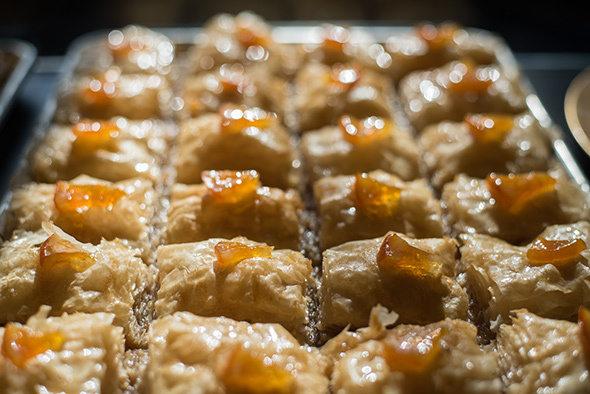 Niki and Taso use traditional recipes, but they've also modernized their baklava by experimenting and tweaking to create new varieties. 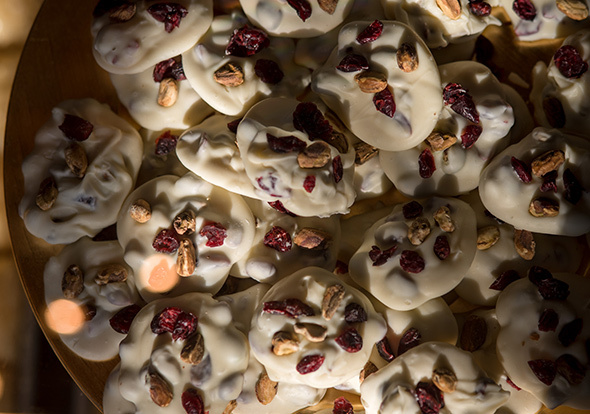 While they still make classics using nuts like pistachios, walnuts, almonds, cashews and hazelnuts, they also have versions that incorporate ingredients like dried figs, prunes, cranberries, orange or coconut to accommodate those with nut allergies. So far they've developed 18 to 20 different flavours, and they try to come up with a new one each month. 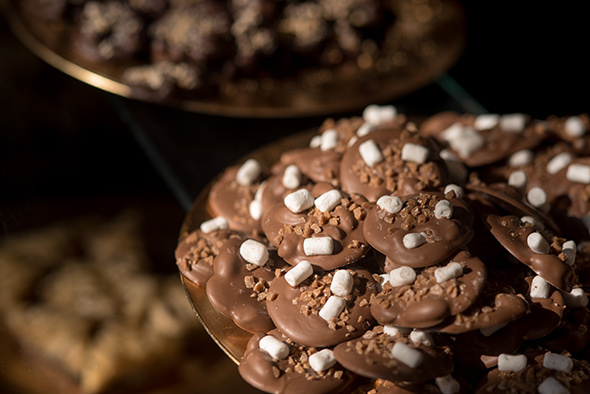 Another popular item are Meli's florentines ($2/piece; $11.99/box), made with pistachios or almonds. 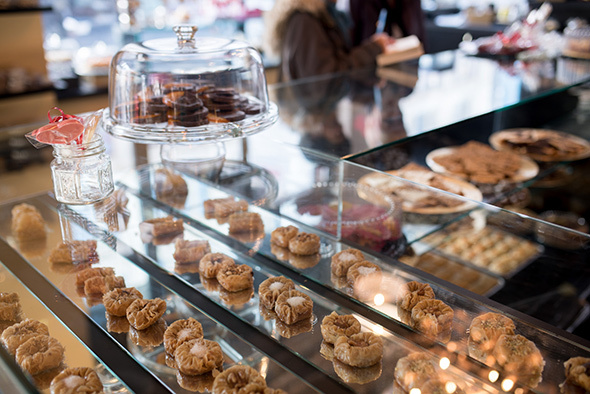 They'll happily assemble customized baskets or platters for customers that can combine baklava, chocolate and biscuits. Julie, who runs the business side of things, tells me they plan to pair their baklava with house-made ice cream or Greek yogurt in the summer, and they're currently working on figuring out how to make delivery work - transporting the fragile filo pastry and keeping it intact is no easy task. It's clear all four are passionate about what they're doing here; Niki hasn't had any days off since they started the business - she says they make everything fresh with no preservatives daily, and the store's stock is replenished twice a day - but she doesn't mind, because she loves what they're doing. Photos by Natta Summerky .